Magdeburger Joe.com: Haiti's Restaveks, What is their Future? Haiti was founded in 1804. It was the first republic founded by freed slaves as part of a revolution against their colonial masters. "sleep with" in the sense of boarding with a family. A restavek is a child from a large family, usually in the country, that can not provide for their children's education or basic upkeep. A family in the city promises to take the child in, feed and educate them in exchange for household chores. What happens in practice is a relationship in which the child must work with neither pay nor legal protection. The host families range from the very wealthy to those who are poor themselves. Many children work in exchange for rags and scraps of food. Three times as many girls are restaveks. Physical and sexual abuse are very common. Children who end up as restaveks often end up in the same cycle of poverty that created their degraded existence. There are an estimated 300,000 restaveks in Haiti. Very many of them were in Port Au Prince when the earthquake devastated the city. Before the earthquake struck, many of them were treated worse than a family dog. Who will look for a child that was given away by his or her own family? What political clout do such dispossessed children have? We take for granted a public school system in place with school lunches. We take it for granted that a child welfare system will attempt to detect the existence of an abused child. Such social infrastructure did not exist before the earthquake. It certainly does not exist now. There are fortunately private organisations that existed before the earthquake that were helping restavek children. The fortunate few who found their way to such organisations found themselves on the road to a future. One such organisation is the Jean Cadet Restavek Foundation. The Restavek Foundation was founded by Jean cadet, a former restavek who came to America, got an education and put a face on the many thousands of Haiti's voiceless restaveks by publishing his autobiography. The Restavek Foundation provides schooling and advocacy to restaveks who come to it. They work with the families with whom the restavek stays, providing subsidised scholarships and a meal to the students who attend. By not asking the host families for school fees, they more frequently get cooperation from the host families of the restaveks. The organisation also tries to work to provide economic opportunities that will enable Haitian parents to keep their children at home and educate them. An economy and a tax base can go a long way toowards alleviating this problem in Haitian society. Miraculously, the Restavek Foundation headquarters remained unscathed in an area that was otherwise severely hit. The Restavek Foundation web site reported as follows on the earthquake aftermath. "Our first step has been to locate and bring together our staff. At this time, we have located eight of the ten. Contrary to initial reports, we have also learned that our Port-Au-Prince office survived the quake and aftershocks. We are extremely thankful for this development, as we had just received a large food and blanket shipment from the US on Monday. “Joan and I are thankful we happened to be here and in a position to do what we can,” emailed Ray Conn this morning. “Fortunately Joan had gotten the entire food shipment to our office the day before the quake. Joan and I have been able to touch base with most of our staff and we are already getting things in motion.” “I believe we have witnessed a miracle”, emailed Joan Conn this morning in reference to the fact that our offices are still standing. Although the office is standing, the area surrounding it is still highly dangerous. The staff has decided to operate out of the Nazarene Church complex in Port-Au-Prince: “I feel this is the safest place in PAP we could possibly be at this time,” wrote Joan Conn this morning." Of course, the work load of the Restavek Foundation as well as the logistics with which it must cope are fare more daunting than they were before the earthquake. 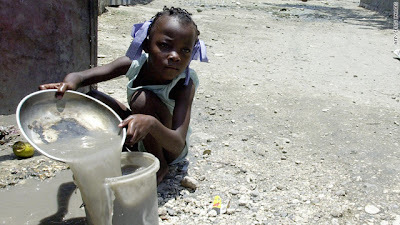 Haiti's child slaves must be high on the list of the world's priorities in rebuilding Haiti. The resconstruction of Port Au Prince is from the ground up. It is societal as well as structural. In the Haiti that rises from the ruins, a place must be found for Haiti's child slaves that is befitting a human being. Such organisations as the Restavek Foundation, which is involved now in general and restavek relief deserve strong international support. How we care for the voiceless and the powerless is the most profound statement of who we are and what we believe. I urge my readers to join me in supporting Haiti's restaveks with donations and expressions of concern. Haiti's child slaves should be America's children and America's concern as Haiti rises from the ruins. As America faces its own difficulties, we must ask G-d's blessing for our future. Striving for the well being and freedom of the 21st century's youngest slaves is a good way to do so.